So you have finally done it! The hard part is over now that you have made the leap. You have decided on a business idea and are ready to get started making your dream a reality. Starting a business involves planning, key financial decisions and completing the necessary legal tasks. 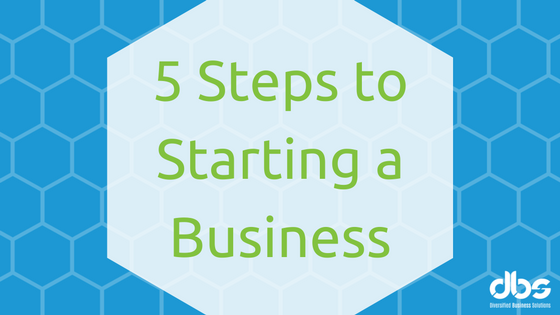 The following 5 Steps to Starting a Business will help you plan, prepare and manage your business. Contact me if you need additional resources or would like help in completing these tasks. A written guide will help you map out how you will start and run your business successfully. There are numerous resources free training and counseling services, from preparing a business plan and securing financing, to expanding or relocating a business. Check with your local bank and Chamber of Commerce for any free or discounted classes/seminars being offered. Local classes/seminars are usually available to assist with your business plan, accounting software, etc. Decide on a name for your business then check with your state government to ensure the name is available and register the name accordingly. Speak with your Accountant and Legal Advisor to determine which legal structure is your best option: sole proprietorship, partnership, Limited Liability Company (LLC), corporation, S corporation or nonprofit. Register with your state and IRS to obtain a tax identification number, workers’ compensation, unemployment and disability insurance.